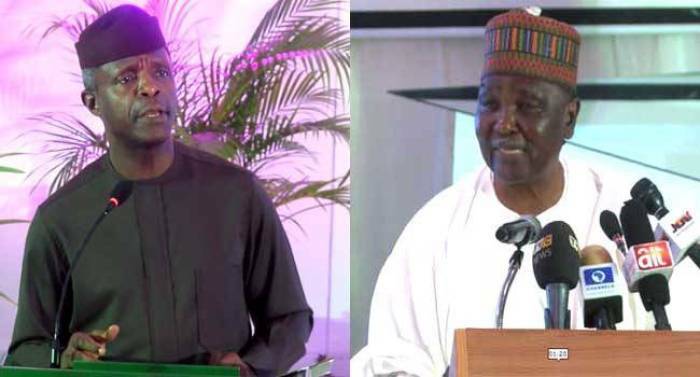 Vice President Yemi Osinbajo and a former Head of State, Yakubu Gowon on Thursday attended the funeral service of late Mrs Janet Ohiwerei, at the Ressurection Parish, Redeemed Christian Church of God(RCCG), Jakande, Lagos. Late Mrs Ohiwerei, who passed on March 21, was the wife of Elder Felix Ohiwerei, a businessman, boardroom czar, former MD of Nigerian Breweries and a member of the incorporated trustees of RCCG. She was a key member of the Hallelujah Band and Shekinah night, a monthly praise night — a platform for worship and testimonies. Pastor Foluke Adeboye, wife of Pastor Enoch Adeboye, General Overseer, RCCG was also in attendance. In a sermon, Apostle Emmanuel Kure, General Overseer, Throneroom (Trust) Minsistry, said it was time to remove the garment of tears and mourning and sing to the Lord. He thanked God for the privedge she gave the deceased to serve him and dedicate her life to him. Kure descirbed late Mrs Ohiwerei as a daughter of grace and a lady of songs. “When she is sad, she sang, when she is happy, she sings,” he said. He said the the deceased, who died at 75, lived a life worthy of thanksgiving. Special prayers were also offered for the family of the deceased.